I would totally lie to you if I told you that I have always loved Khoresht Karafs. As a child I didn’t, it didn’t do much for me. Then one day during a two year stint as a pesco-vegetarian I decided that it was the easiest thing to convert to a vegetarian meal. I won’t get into the details of it all because you might be horrified if I told you what I substituted the meat for; suffice to say that the results were good and I would do it again need there be. Anyway, I remember calling one of my cousins to ask her for the recipe. She told me how to make it and she advised me to put plenty of onion and mint in it because, well celery doesn’t taste like much and I was not going to use any type of meat in it, so my stew would basically be tasteless. A good ten years later I have figured out a way to make this recipe and it tastes delicious. There are three simple steps in making this recipe a masterpiece. 1) I have learned that cooking the meat first with water allows it to turn into the broth that the veggies are going to be cooked in later. Basically you are building your first layer of flavor. 2) I don’t like it when celery is overcooked and mushy like. 3) The celery itself should be the star, meaning that you are better off buying your celery at the farmer’s market instead of a grocery store. Simply put they just taste much better, consequently, your dish is going to be much better tasting! While my cousin’s advice to put plenty of onion and mint was good, I think what truly makes this dish is the celery itself. Loot at the beauty above, they all came from our local Farmer’s Market in Torrance. Look at the celery, it still has its leaves and this is truly a blessing to anyone who wants to make Khoresht Karafs because the leaves add a whole other layer of delicious flavor. In a Dutch oven sauté onion, green onions, and garlic in 4 tbsp of oil until translucent. Add meat, in this case I am using lamb, but you can use any type of meat you want, brown a bit and then add turmeric. Give it a few stirs in order for the spice to release its flavors. Season with salt and pepper, punctuate the dried Persian lemons or give them a light crush, throw them in, add 3 cups of water. Cover and cook for 1 hour. Add chopped herbs, advieh, 2 cups of water, and adjust seasoning. Cover and cook on medium for 1 1/2 hours. Once done your khoresht should look like this and your kitchen should smell heavenly! Place in a dish and serve over rice. On a last note, this dish falls under gluten-free when served over gluten-free rice. 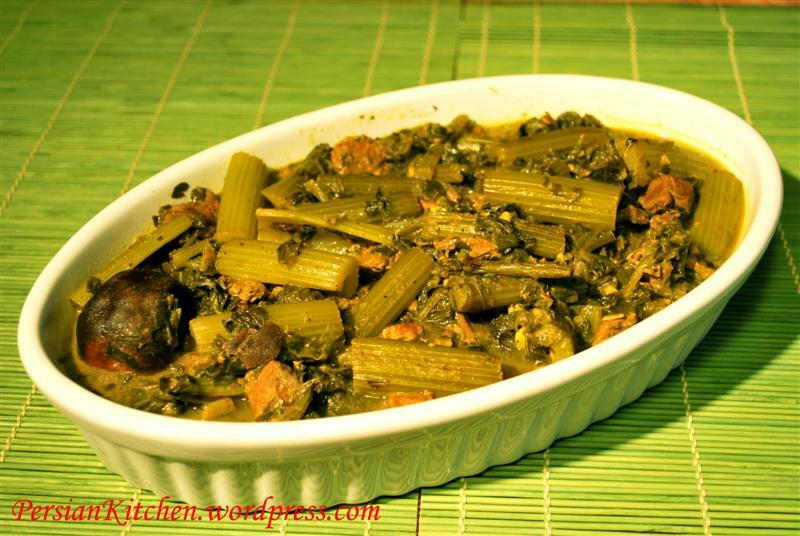 I am so glad to find this site, my husband love diferents types of cuisines and lamb in stews. I have a question: How can I replace the advieh spice? thanks for stopping by, since you have asked I will post a recipe for how to make your own homemade advieh! I found different recipes for edvieh and each one has different ingredients. They range from cardamon, cummin, cinnamon, rose flower petals, ginger, cloves, and the list goes on. I wish to make this dish tomorrow. Please let me know the ingredients. The blend of spices make you to really enjoy this dish and keep every bite in you mouth a little longer to flavor it while you close your eyes. Will cook it again for sure. You just made my day!! I am so happy that not only you cooked this dish but also enjoyed it immensely!!! So what was the content of the Advieh? It never got posted?? I have to go back to the drawing board here. It has been so long since I made the vegetarian version. But just on top of my head I would most definitely use vegetable bullion for some added flavor to substitute the flavor that meat brings to the stew. Let me know if this helps. I can try making it again and post about it. there is a post with the advieh recipe. Click here. I just found this blog today, and now I’m making this. It smells delicious. Love the blog, and I love Persian food. thanks for stopping by and I am glad that you have found us! Let me know what you think of this stew once you have made it! I am so glad I found this site and your recipe for Karafs. My husband is persian and I love to learn how to cook some of the dishes from his home. I am glad you found us! Keep me posted on the dishes that you make! What meat specifically do you use for Khoresht Karafs and do you use this for other Khoreshts as well? But which cut of lamb? My wife and I like both lamb and beef in khoresht, or even no meat in some. But it is the actual cut I am wondering about. A lot of “stew” meat that is already packaged from the supermarket comes out tougher than I want even with a 2 hour cooking time. I have taken to buying other cuts and trimming them and cutting into chunks. But I have not settled on a particular cut yet. I know exactly what you mean Aaron. I personally bought the lamb that I used in the posted recipe in a roast form. It was packaged in a net for roasting. I opened it up and cut it into pieces. It actually worked out really well and it was really nice and tender. Thank you that is exactly what I was wondering. Just finished eating this…HOLY CRAP IS IT DELICIOUS. Haven’t had (good) persian food since I was out in LA last spring…good lord, not for lack of trying on my end, its just that most of the recipes online are a tad vague…but not on this blog! Love the photos, it helps me notice if I’m screwing up on a step-by-step basis. I made this all vegetarian-y, and it was still fantastic (I used a pretty good amount of vegetable bullion, and i do think it probably helped a lot)….now if i could only make a competent tahdeeg…..
Nick, you simply made my day with your comment! Growing up Persian food and rice was on the table every night of the week. Mostly made by my grandmother, but my mother had her specialties as well. As a mom I cook these dishes regularly for my family. We had this stew tonight for dinner, my 6 year old loves it which completely surprises me because I did not touch any of the Persian khoreshts of my parents until I was at least 19 years old! Shaya, that’s awesome that your kid loved this khoresht. It definitely was not one of my favorites when I was a kid, but now I totally love it! Louisa, Persian lemons or limes are the dried version of the fresh ones. They are usually sold at Persian markets. Just wanted to let you know that I made this today and it was a big hit! I’ll definitely be making it again, next time with lamb (I used beef today). Thanks for a great recipe!